This is a fascinating plant and Bidens ferulifolia has its place in the garden as well as in hanging baskets. The flowers are a golden yellow and last from mid spring right through until the end of summer. With the common name of ‘Tickseed’ the plant was formerly known as Coreopsis ferulifolia. The interest comes from the different forms, some are upright and will form a large plant over time. Others are lower growing or trailing. All are vigorous and all have masses of yellow flowers from summer through to autumn. 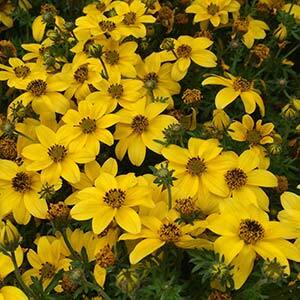 Originally from Mexico, it is the cultivars such as Bidens ferulifolia ‘Bidy Gonzales’ that are the most popular. These are lower growing at around half the height of the species. B. ferulifolia ‘Tweety’ – To around 40cm in height. B. ferulifolia ‘Sunnyside’ – Larger flowers than some. B. ferulifolia ‘Flair’ – Reaches around 40cm in height. Excellent in hanging baskets, also suited to a sunny position in the border or a container. Very attractive to bees, butterflies and insects when in flower. Prepare soil before planting by amending with some well rotted compost. Division and pruning are also very easy. Water in well with aliquot seaweed fertiliser. Over time Bidens ferulifolia will form a clump and can be divided in spring for propagation. After the first flush of flowers, give the plant a light trim with hedging shears to maintain a compact shape if desired. Foliage – Mid to deep green and fernlike.